South Africa, 2012, 81 minutes, Colour. An animated adventure for families and younger children. And from South Africa. Quite an achievement for the Cape Town studio which produced it. Not as elaborate in animation, characters and backgrounds as contemporary American big-budget productions, but effective nonetheless. There are rather naturalistic backgrounds, desert, rivers and waterfalls, jungle islands. The characters, birds and giant lizards, are traditional in their drawing style. A pity that the producers decided that most of the voice cast should be American rather than local. Marketing demands, one presumes. 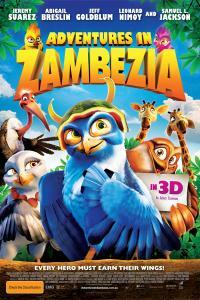 And Zambezia is not so far from Madagascar, though it doesn’t have as many zany animals as the American series. The focus here is on birds. First of all, we see a young bird (voiced by Jeremy Suarez) and his widower father (voiced by Samuel L. Jackson), isolated from other birds, the father trying to protect his son. There are some scavenger birds, quite ugly buzzard-looking – and with extraordinary Pommy accents courtesy of Richard E. Grant. Not only do they threat but there are huge, semi-dinosaur-looking lizards, who threaten the birds (and do a deal with the buzzards). The young bird flies the coop and joins birds travelling to Zambezia, a kind of huge aviary Utopia, near a waterfall. All is delightful here, a whole range of birds and beauty, paradise. But then the lizards threaten. The battle proves that community works best together, even in heroics. ‘No bird is an island’. This message seems important for South Africa post-apartheid, that many groups can live together, work together, prosper together and defend itself common enemies. 1. A film for the family audience? Especially young children? 2. A South African production, animation and style, African backgrounds, the use of actual locations, trees, deserts and cliffs? The animation of the characters, birds, colorful? The musical score, songs? 3. The cast, American, British accents? 4. The desert, water, Victoria Falls, the bird sanctuary? 5. The idea of Zambezia? The quote: no bird is an island? Individuals, building up community? This idea in the South African context? A variety of people, living together in harmony, fighting common enemies? A haven for peace? A message for contemporary South Africa? 6. The opening, the carrier, the eggs, the buzzards? The isolated bird with his son? 7. Father-son relationships? The search for origins? The young bird, boasting, demonstrating his skills, accidents? His being alone? His father, the memories of his wife, with the feather? Realizing that his son needed to go out into the world? 8. The young bird, the buzzards, the carrier, the eggs? His joining the flight, becoming friendly with the birds? 9. Zambezia? The place, the trees, the cliff, the falls? The range of birds? The leader? Comic, serious, the young bird, savings Zoe? The Hurricanes and their protecting Zambezia? 10. The giant lizards, the threats, to the father? The travelling? Confronting the buzzards, the plan and subservient? The buzzards and their particularly British accent? 11. The attack, the visuals of the fight, flights, the lizards, the bridge and its collapse, falling into the falls? The buzzards changing sides? 12. The father, the past, the confrontation of the enemy? His son helping? 13. Zoe, the fall, the rescue? 14. The lizards and their being sinister? The frog story and his final escape?